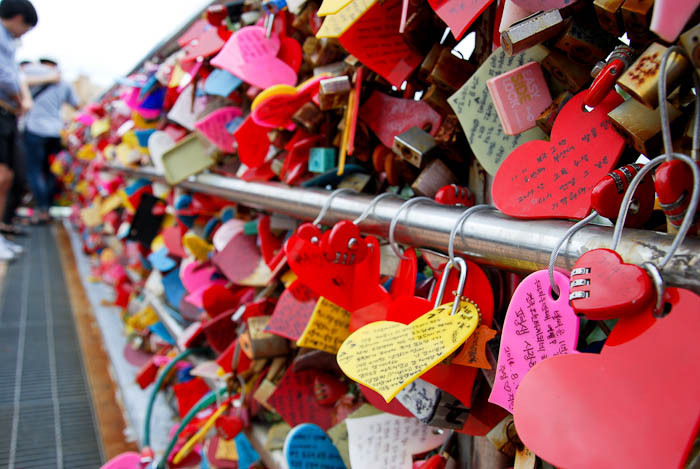 Locks of love at Busan Tower. 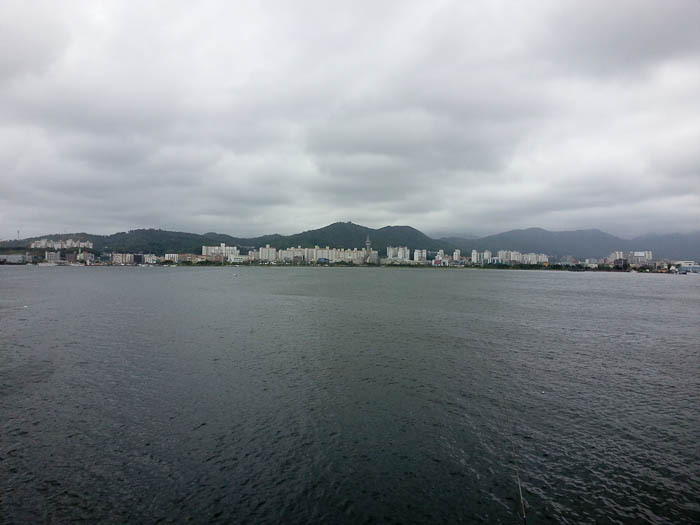 View from the bar on the top floor of Sun Cruise Resort in Jeongdongjin. There was a pepper festival in Eumseong on the street adjacent to my apartment building last week. This is the liveliest I’ve ever seen this town. 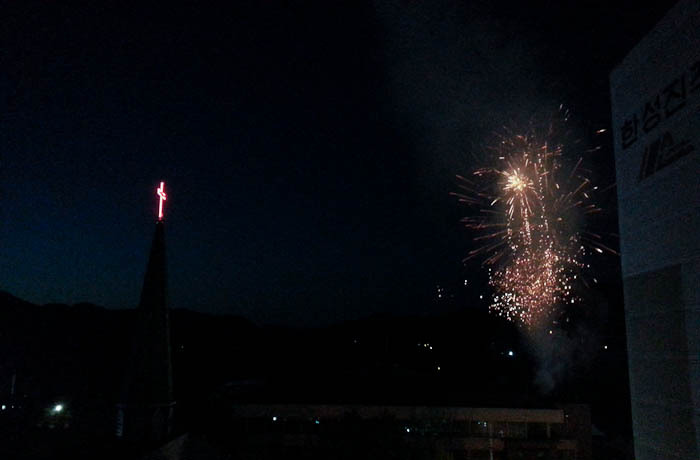 There were nightly fireworks (and loud music) directly outside my front door during Eumseong’s five day pepper festival. 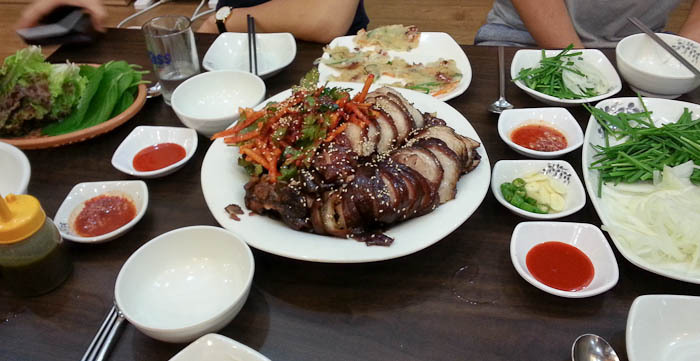 Jokbal, also known as pig’s feet. Yes, I ate pig’s feet. It doesn’t sound appetizing but it was actually pretty good. 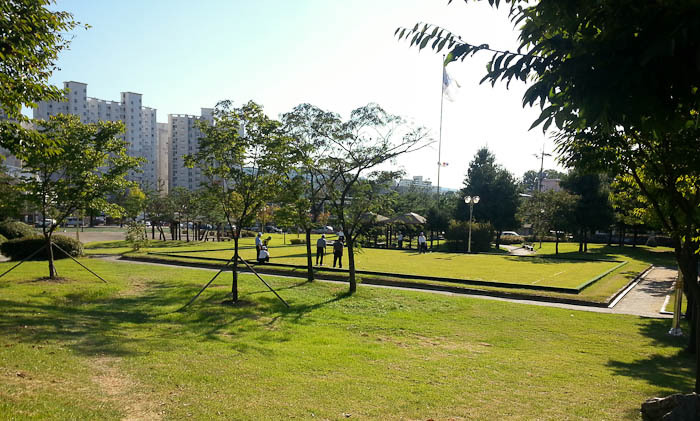 The park in Eumseong where old men gather to play croquet every afternoon. 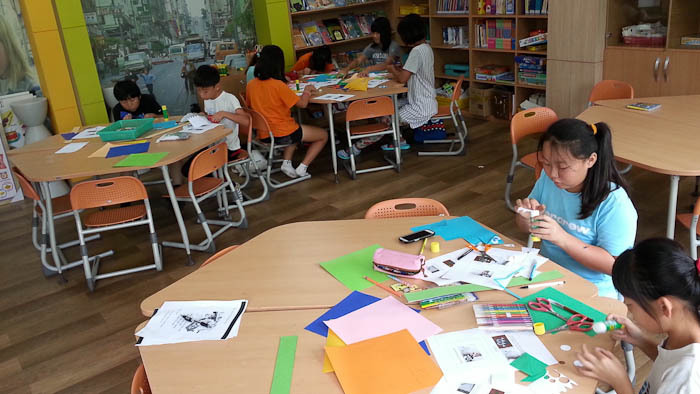 Craft day with 5th and 6th graders during summer camp. 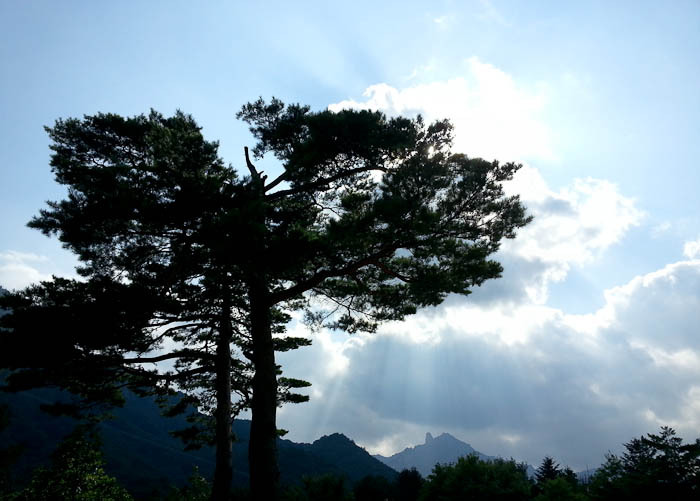 The Korean flag, or Taegukgi, blows in the wind on Ulsanbawi. Its been a long time since I was in elementary school, but I don’t I recall anyone ever saying they were looking forward to their school’s lunch. I hear they’ve improved since I was kid, but I’m guessing you still can’t really call them balanced, nutritious, or delicious. 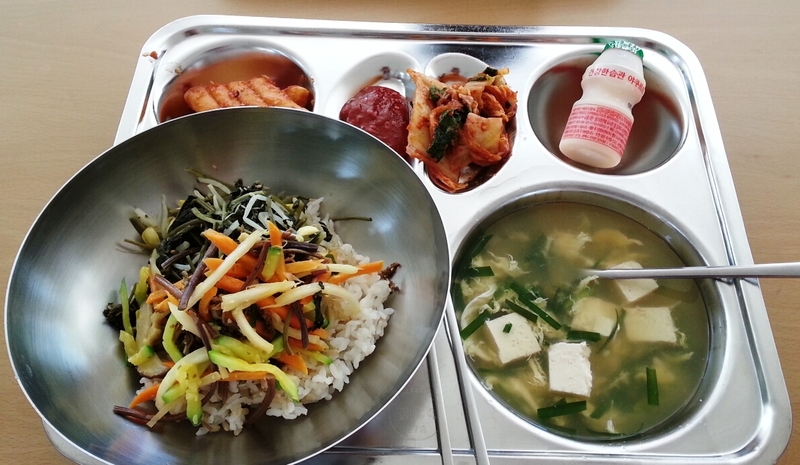 In Korea, since all students, staff and teachers eat together, school lunch is something I actually look forward to as I find them really tasty and quite healthy. While there’s variety in what ingredients are used each day, there’s always a soup of some sort, a vegetable, a protein, kimchi, rice, and either a piece of fruit, fruit juice, or yogurt. In other words, a pretty balanced meal. 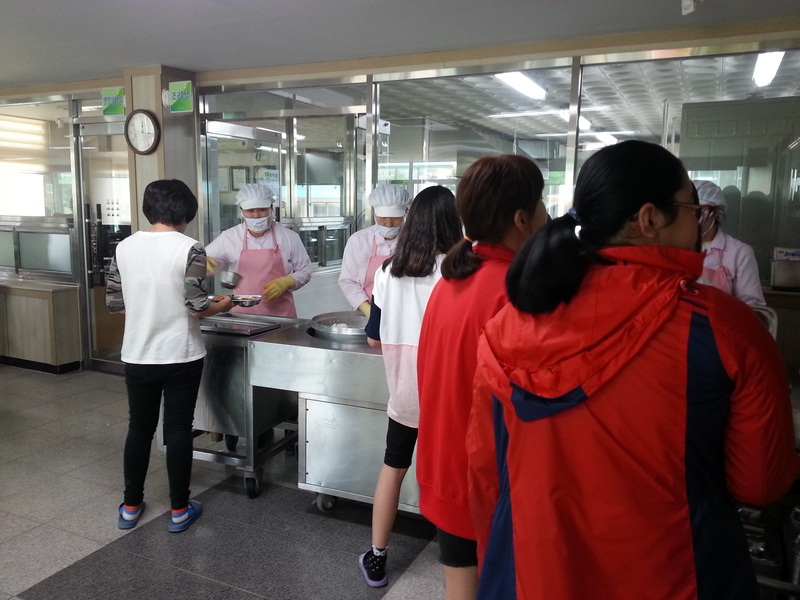 Perhaps part of the reason public school lunches are better than American lunches is they aren’t free (with the exception of Seoul, where after much controversy in 2011, free lunches are now provided to all elementary and middle school students). 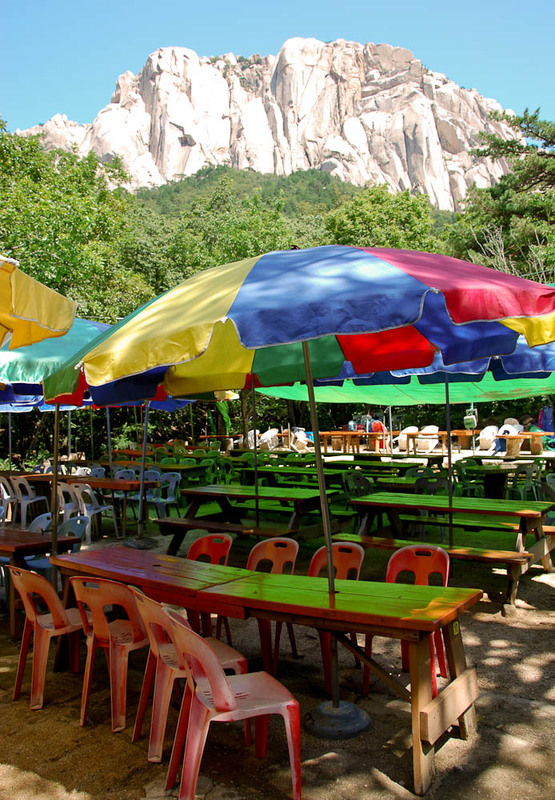 As a teacher in a rural school, 3,000 won (just under $2) is deducted from my paycheck per meal and students pay roughly 40,000 won per month. Eating the school’s lunch is not mandatory, but I really don’t see how I could pack a lunch that would be just as good for any cheaper. I also think it helps that the smaller of my two schools has a large vegetable garden, providing the freshest ingredients. Sweet and spicy rice cakes, spicy red pepper paste for the bibimbap, kimchi, yogurt drink, bibimbap, and a tofu, egg and green onion soup. 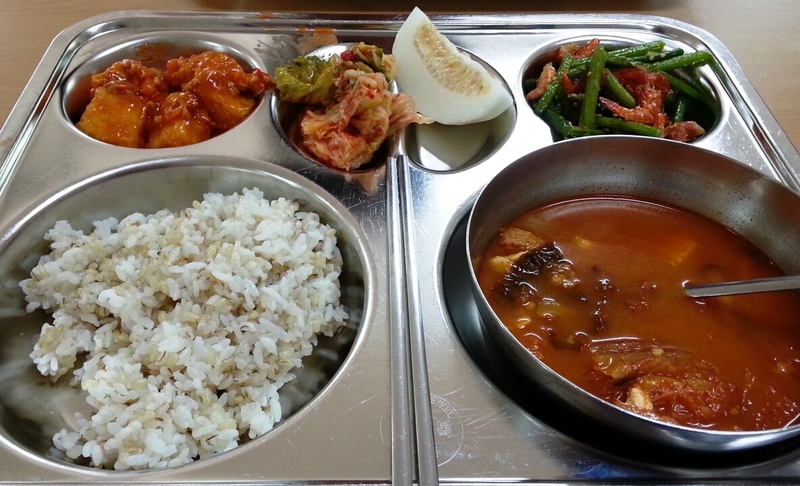 Sauteed tofu, kimchi, a Korean melon, green beans with dried shrimp, rice, and a kimchi and pork stew. 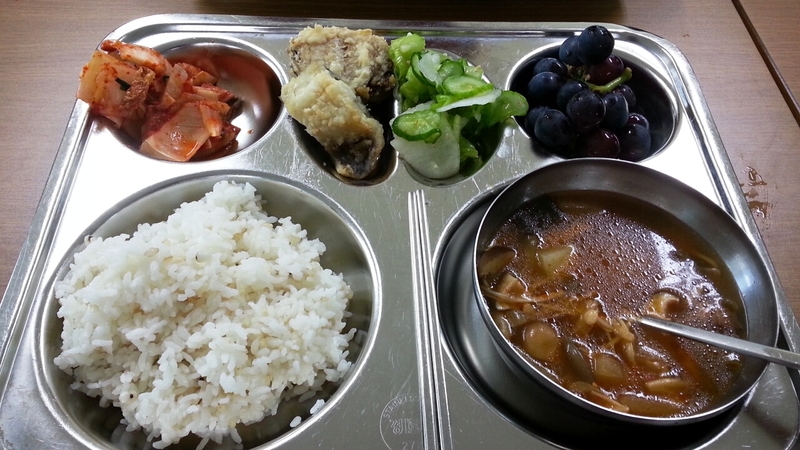 Kimchi, fried fish fillets (they don’t ever de-bone fish here, by the way), pickles and radishes, grapes, rice and a beef and vegetable soup. At both of my schools, students and teachers are served by “lunch ladies” and each homeroom class sits together with their teacher in the lunch hall. I have heard some schools serve lunch buffet style and eat in their homeroom classrooms. 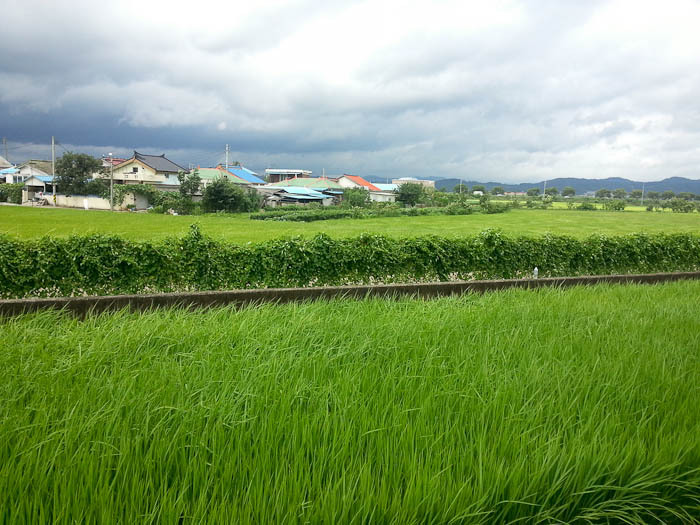 A storm brewing and wind blowing though rice fields at the Cheongju Airport train station. 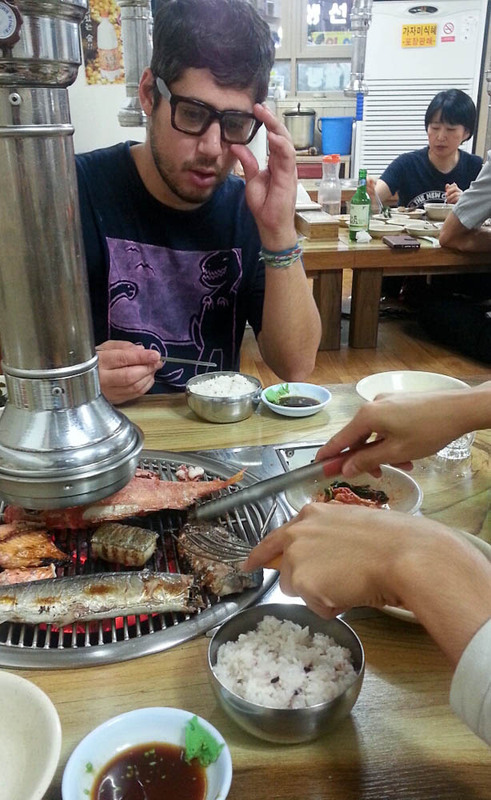 Korean bbq in Eumseong with David and four of the six other English teachers that live in my town. 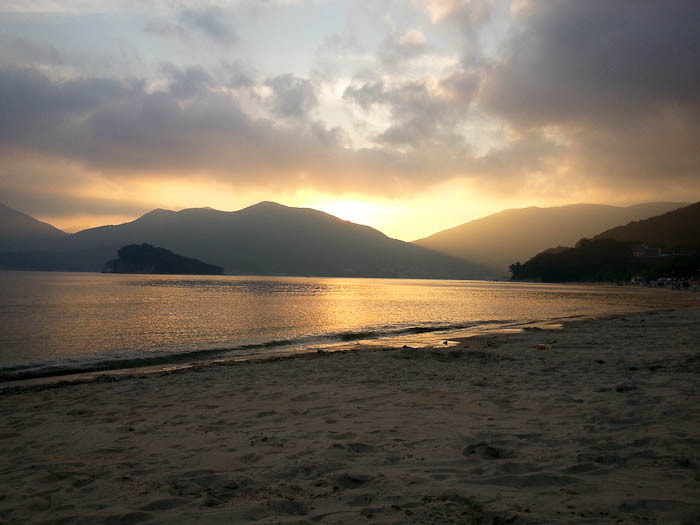 Sunset on Chuseok at Gujora Beach, Geoje Island. 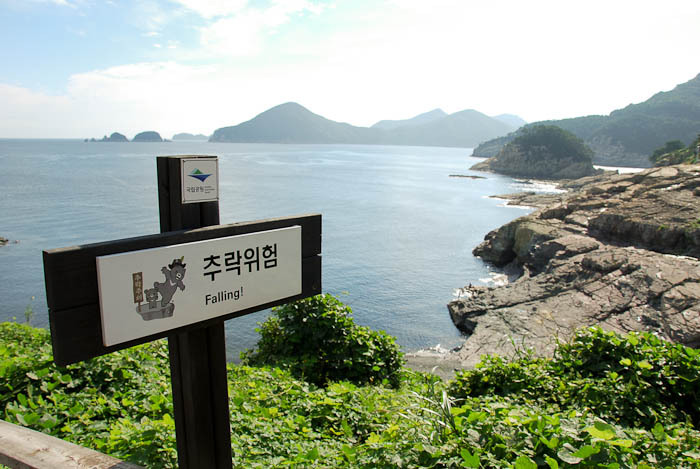 Falling warning at Sinseondae, Geoje Island. 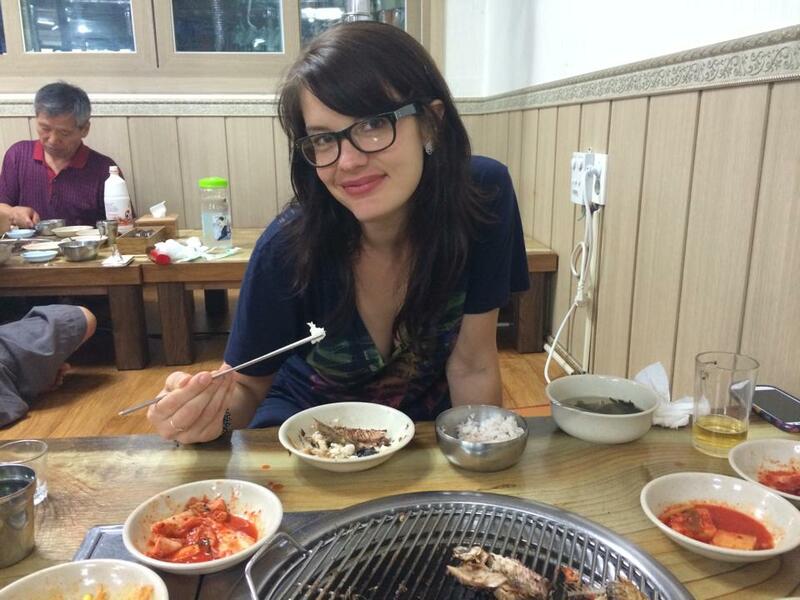 I’ve adopted a few Korean camera poses. 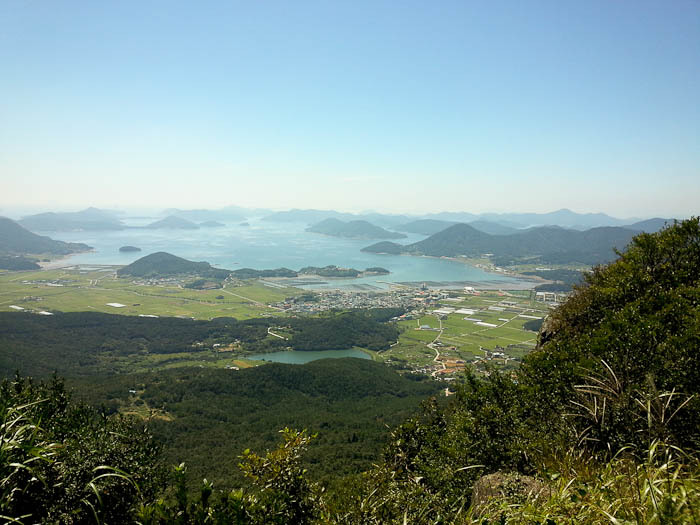 View of rice fields and the many islands surrounding Geoje. 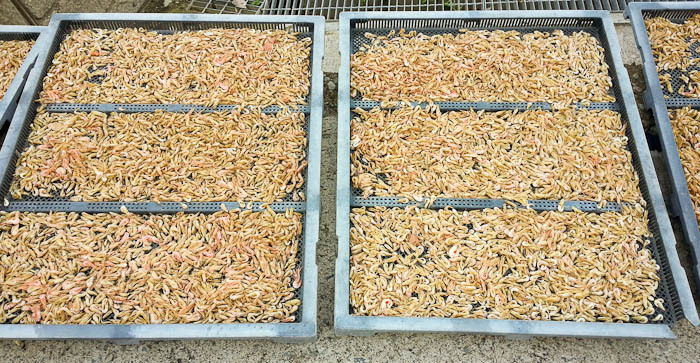 Thousands of baby shrimp drying in the sun. 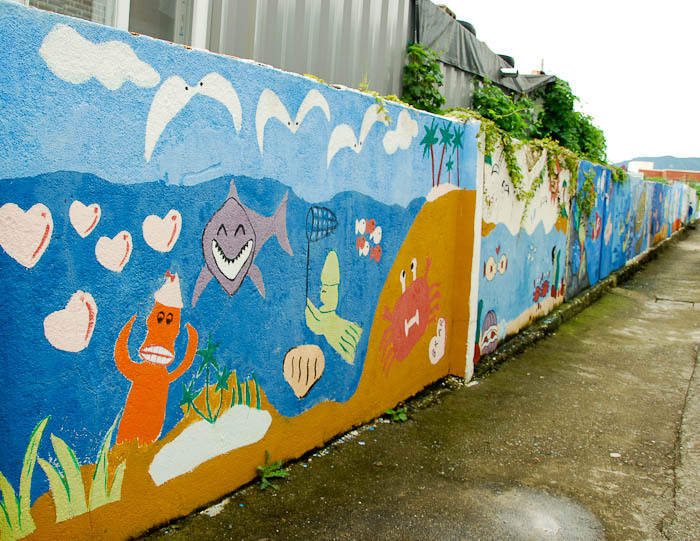 All of the alleyways in Gujora Village on Geoje Island are brightly painted. SpongeBob SquarePants even makes an appearance. You can’t always trust guide books. 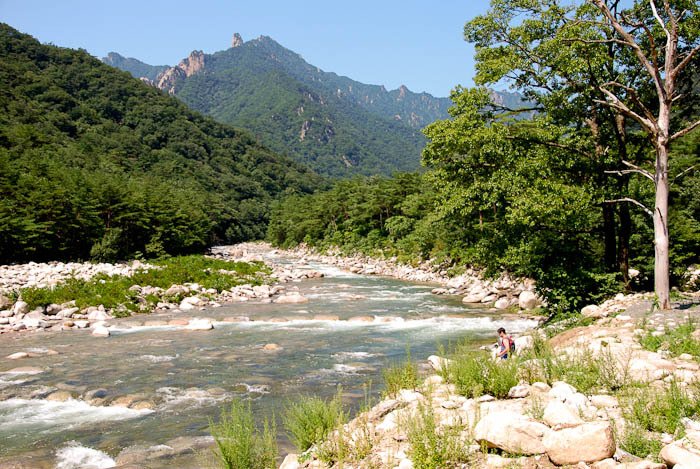 If it weren’t for Sokcho’s proximity to Seoraksan National Park, I might have skipped over the city entirely. 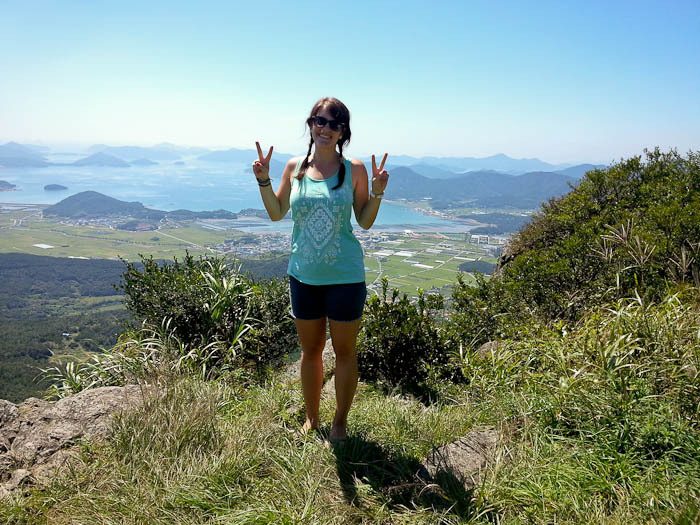 The book I picked up before coming to South Korea makes Sokcho seem like a drab little port city with nothing to offer besides a base for visiting the extremely popular national park nearby. On the contrary, David and I found it to be extremely pleasant and really enjoyed three nights there. 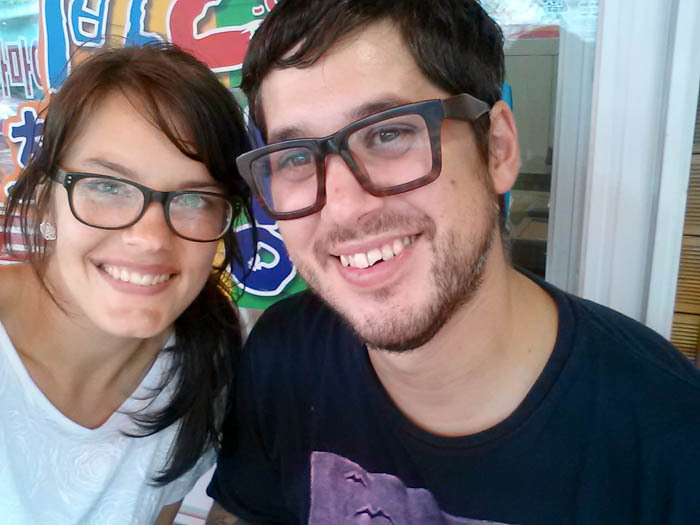 It was the first stop on our two week summer adventure. 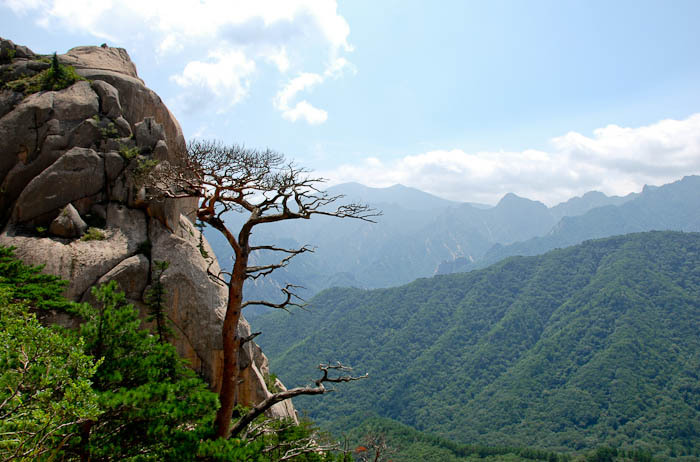 Sokcho is a smaller coastal city in northern Gangwon Province. 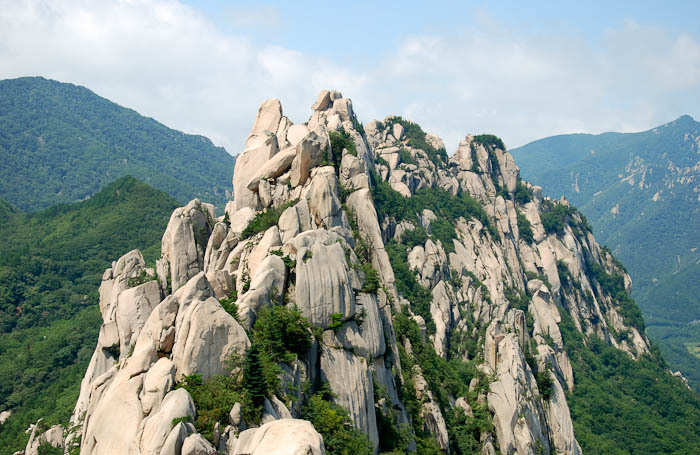 We took a bus from Seoul which took just under 3 hours and cost us each about $16. Since summer is peak travel season in Korea, we booked a few nights at Afterglow Guesthouse prior to arriving and I’m really glad we did. 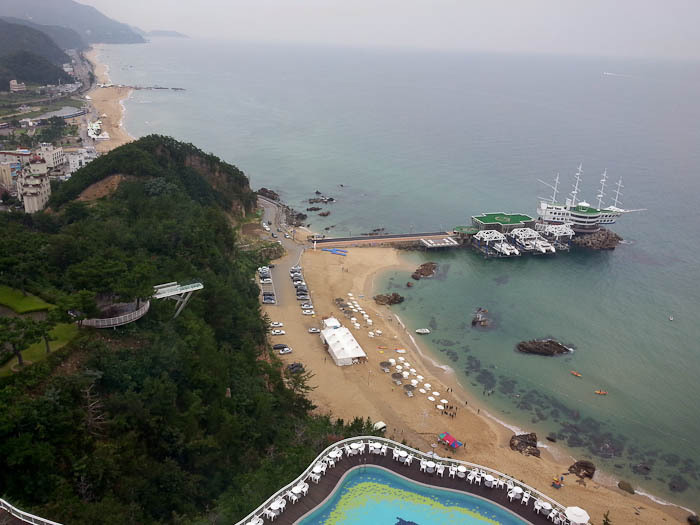 I highly recommend staying there if you ever find yourself in Sokcho. A private room with our own bathroom, TV, air conditioner, clean towels everyday, non-fluorescent lighting and a comfortable bed was only $33 per night. 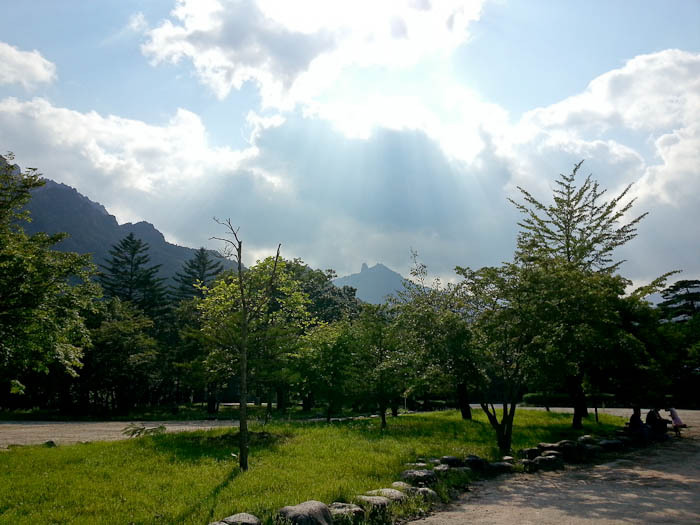 It was the coziest, cheapest and cleanest place I’ve stayed in Korea. 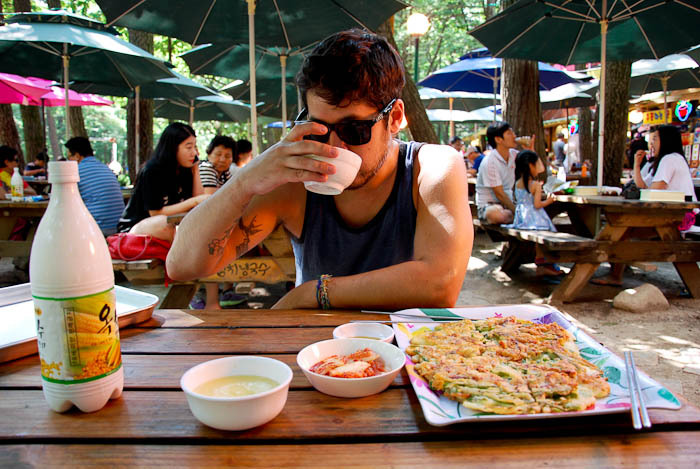 (Outside of Seoul and Busan, guesthouses or hostels like this are hard to come by in Korea.) The owners are extremely kind and graciously helped us out with anything we needed, including umbrellas when we got caught in a rainstorm and walked in soaking wet, as well as hand drawn maps and weather updates. 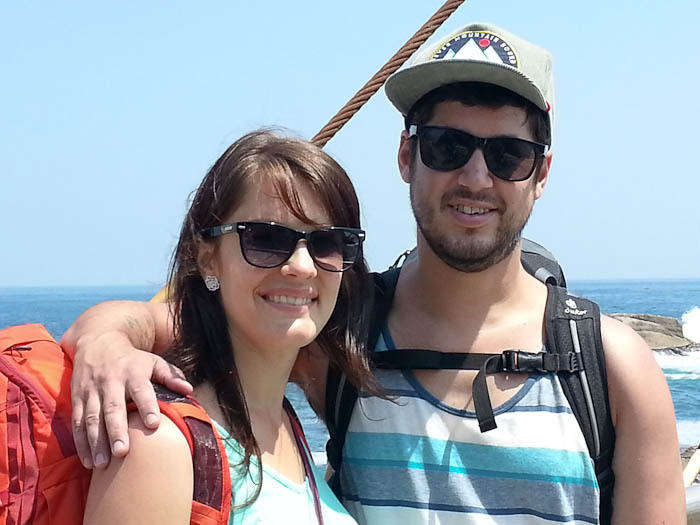 They are a younger married couple who have done quite a bit of world traveling themselves, therefore know exactly how to make everyone’s stay as convenient and comfortable as possible. 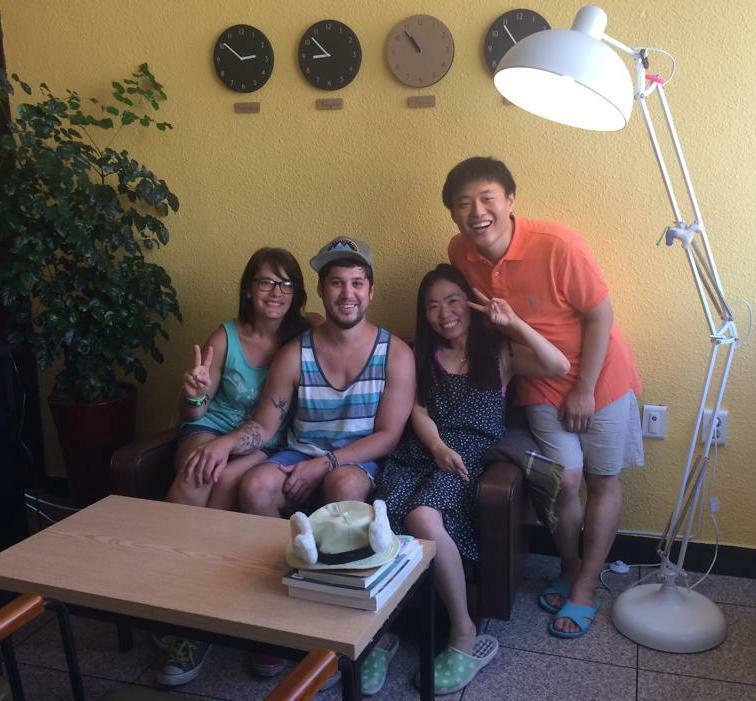 The Afterglow Guesthouse owners were very excited to have our picture taken with them. 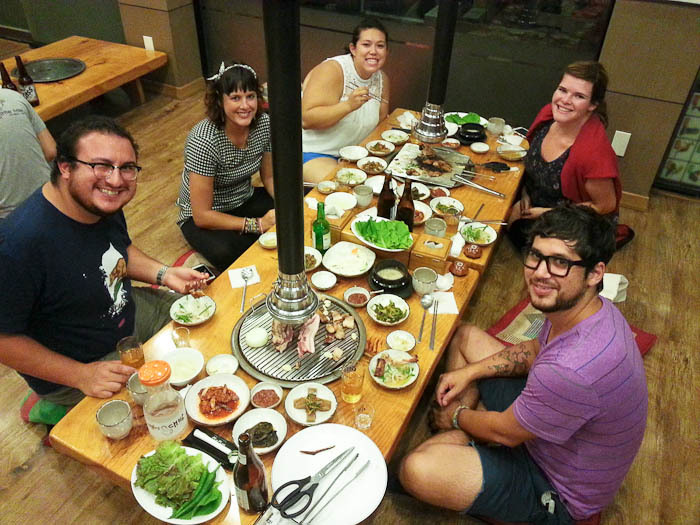 We enjoyed dinner at a fish bbq restaurant on our first night in Sokcho. It was delicious. David can hardly believe his eyes. 😉 A young man working at the restaurant spoke a little bit of English and was able to tell us the names of most of the fish as he manned the grill at our table. One of tastier ones was simply called “the most delicious”. He was right, it was the most delicious, whatever it was. 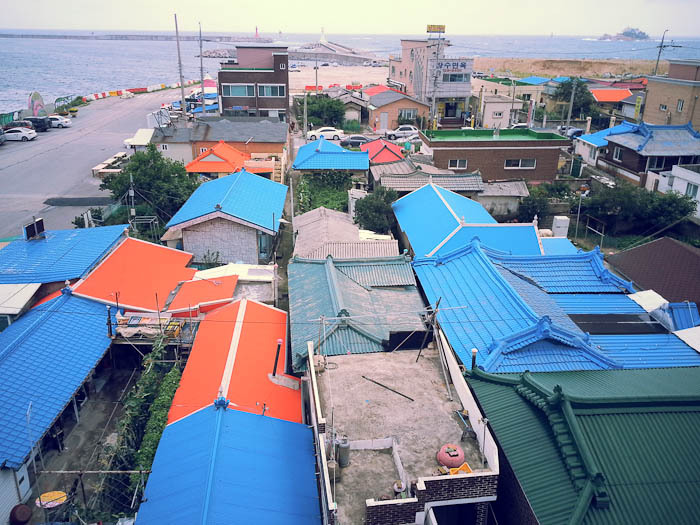 On our first full day in Sokcho, after enjoying free coffee and cheese toast provided by Afterglow, we headed out with a map to wander the city with no real agenda. It started out as a cloudy morning and turned into a super windy, rainy day which required a pit stop at 7-11 for a rain poncho. That didn’t stop us from having a blast exploring, however. 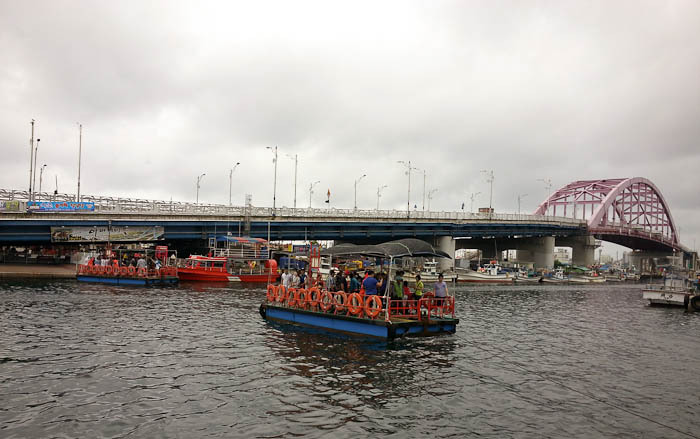 We took the gaetbae boat to Abai Village, a spit of land between the East Sea and a harbor that was supposed to be temporary housing for North Korean refugees during the Korean War, but it turned permanent after the DMZ was established. 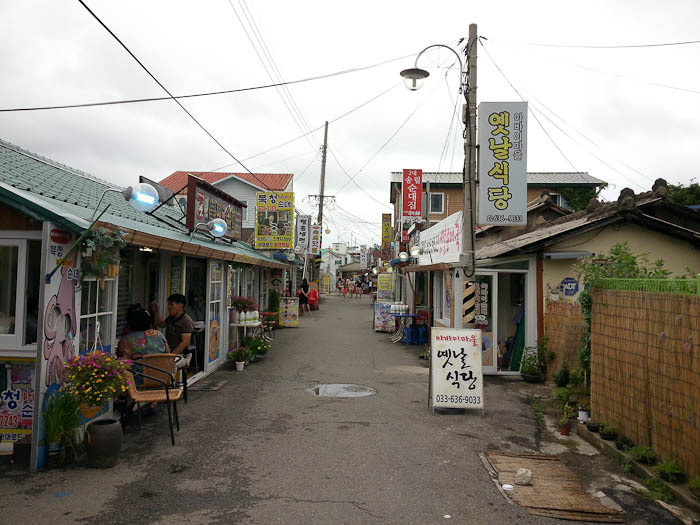 It’s now filled with lots of tiny restaurants known for ojingeo sundae (a type of Korean sausage made with squid, rice or glass noodles and vegetables) so we stopped for lunch to try some. The small man powered ferry, or gaetbae boat, taking us to Abai Village. 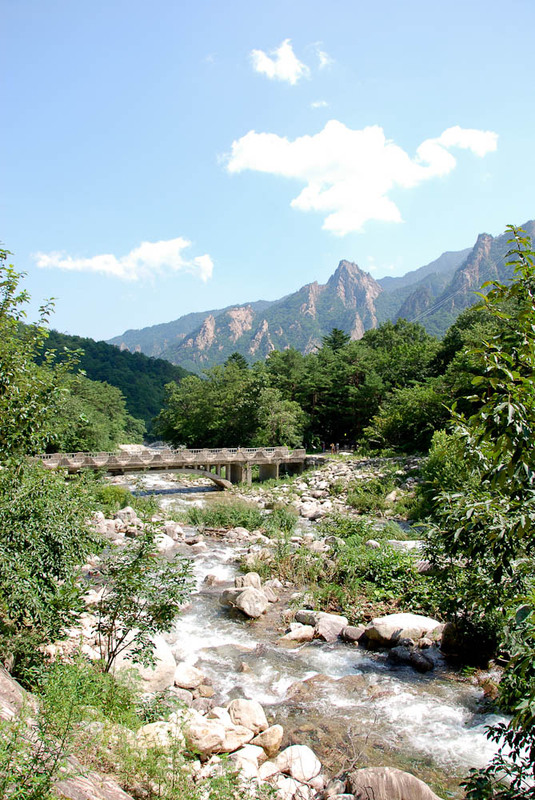 Many older North Korean residents fled to Abai Village during the Korean War, waiting for things to settle before returning to their villages and farms up North. 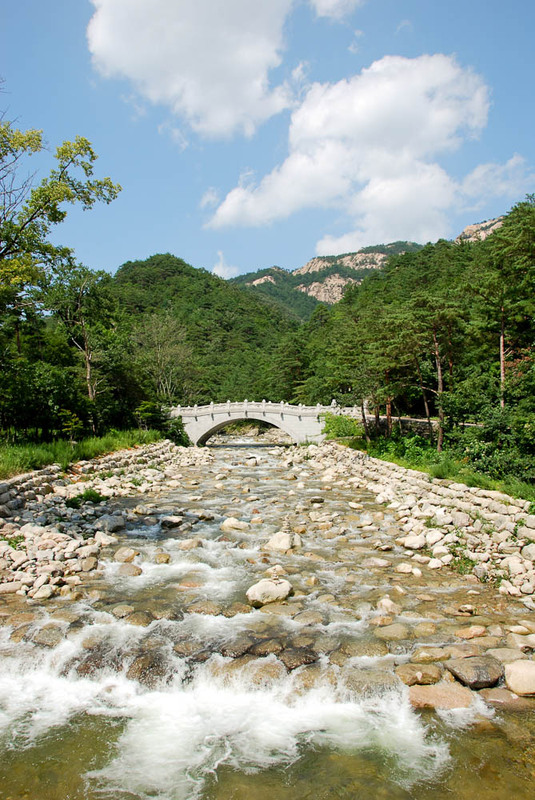 After three years and no sign of settling, the DMZ was established and they were stuck in the South. 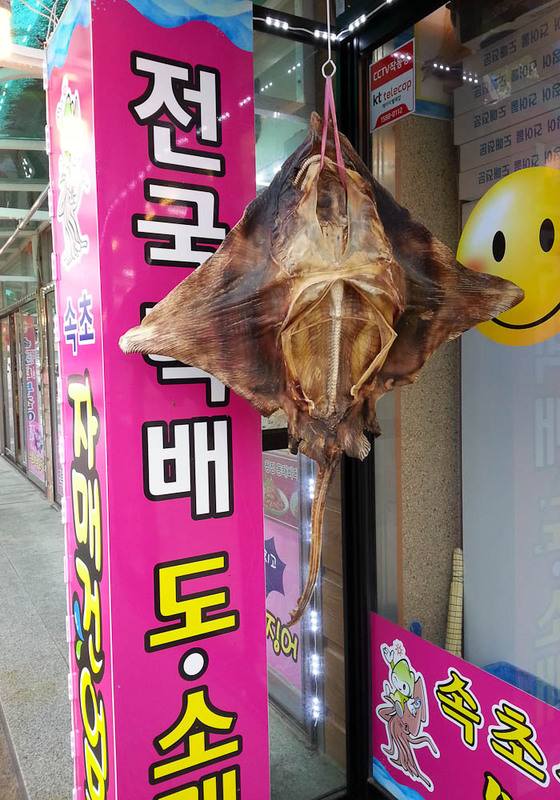 We stopped for lumch to try some ojingeo sundae, a type of Korean sausage made from squid, rice and vegetables that is known to be the best in Sokcho. Lunch break in Abai Village. After taking in views of the wild, stormy sea and exploring a few lighthouses, we decided to stop for an afternoon green tea latte and a game of cards to catch a break from the wind and rain. It was then that we noticed how many people were carrying the same box of fried chicken (yes, fried chicken is big in Korea). David and I decided we should probably figure out where these boxes were coming from because all the Korean tourists seemed to be carrying them. Thanks to our friend Google and my ability to read Hangul, we were able to locate the famous fried chicken place called Manseok Chicken and decided that’s what we’d have for dinner. 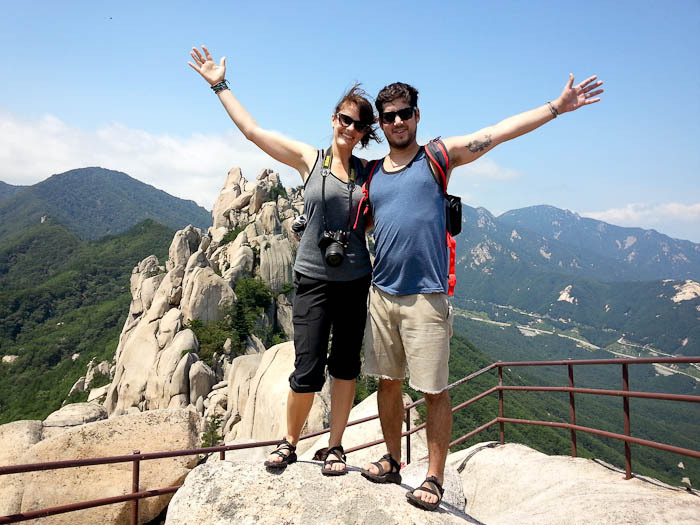 To build up our appetite for this gigantic fried chicken feast, we did some more exploring and walked to the other side of the city and stumbled upon Sokcho Beach. 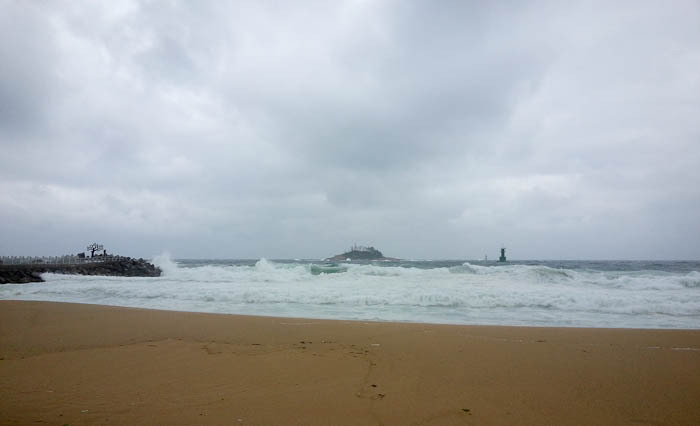 Unfortunately, the weather was so bad at this point we were told we couldn’t even be on the beach. 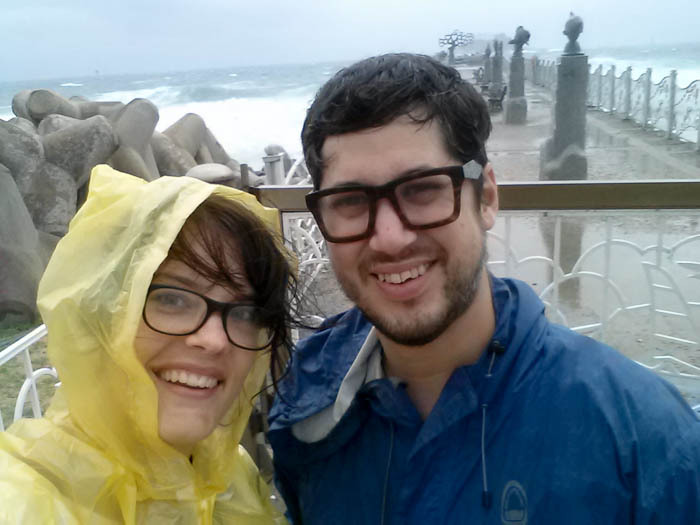 We got in a few rainy snapshots beforehand, however, and instead of enjoying a beer on the beach in our rain ponchos like planned, we found a nice park bench surrounded by trees, shielding us from the wind and the rain (there are no open container laws in Korea, by the way). 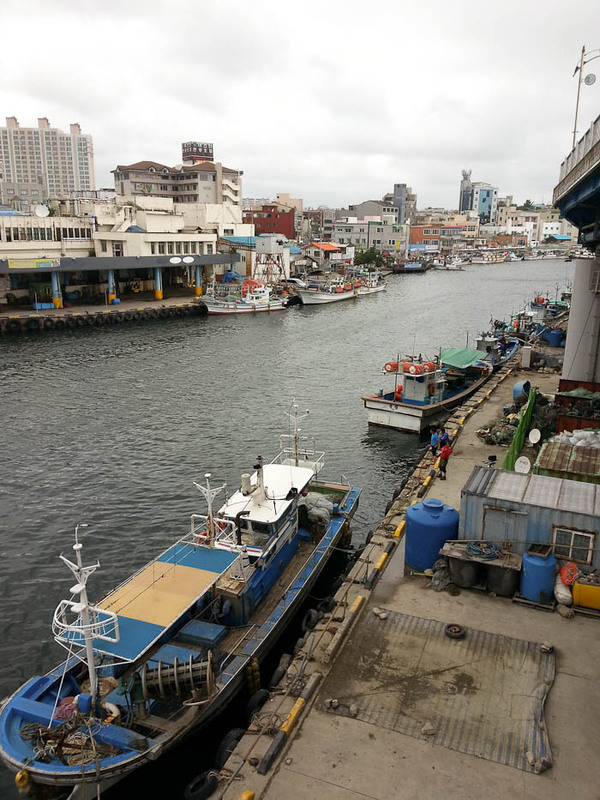 Looking down at the Abai Village ferry crossing. 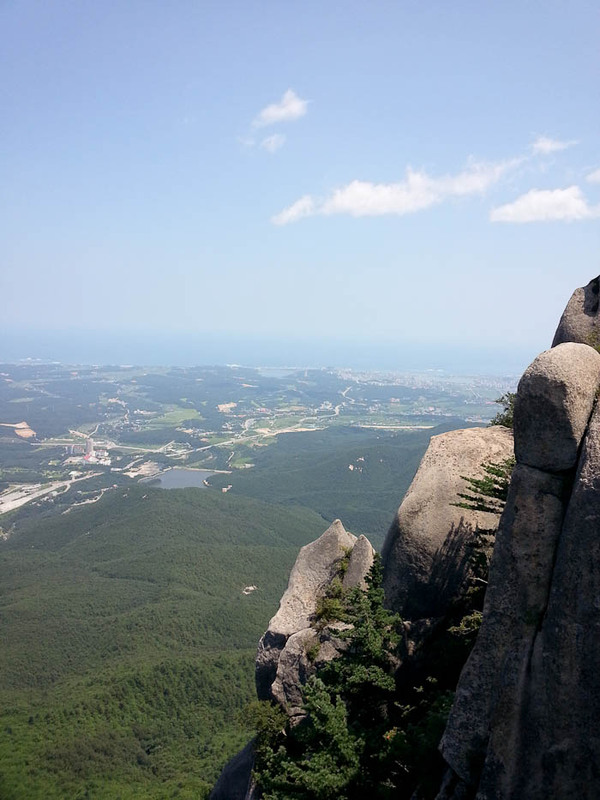 View of Sokcho from Abai Village. Not quite beach weather but still beautiful. 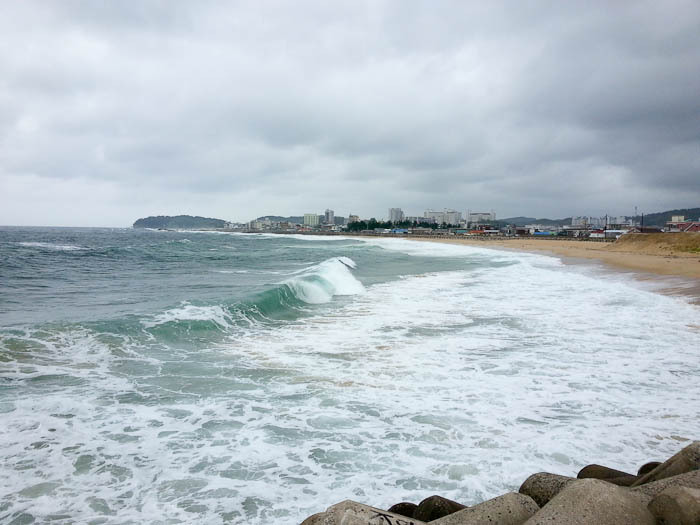 Wild waves on Sokcho Beach. We were able to snap a few photos before being kicked off the beach. I guess they “close” the beaches in really stormy weather. 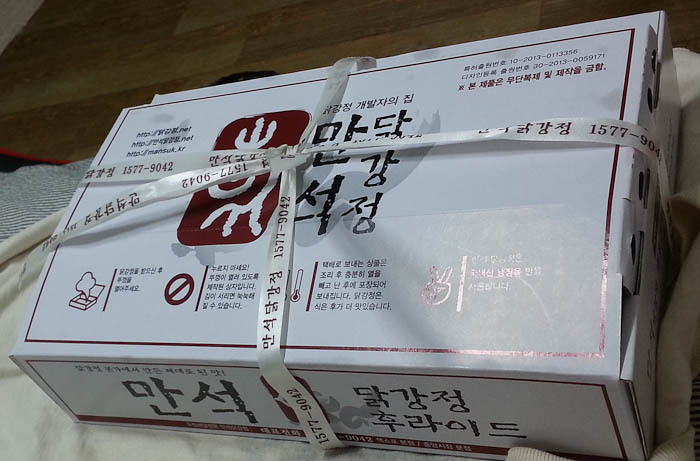 Nearly all the Korean tourists were carrying these boxes of Manseok Chicken, an apparently famous chicken stand in the Jungang Fish Market. After enjoying a large fish dinner the night before, we decided we had to see what all the chicken fuss was about. We opened the box to discover a large amount of fried chicken drenched in a spicy, sticky sauce. Is this much chicken necessary for two people? Probably not. 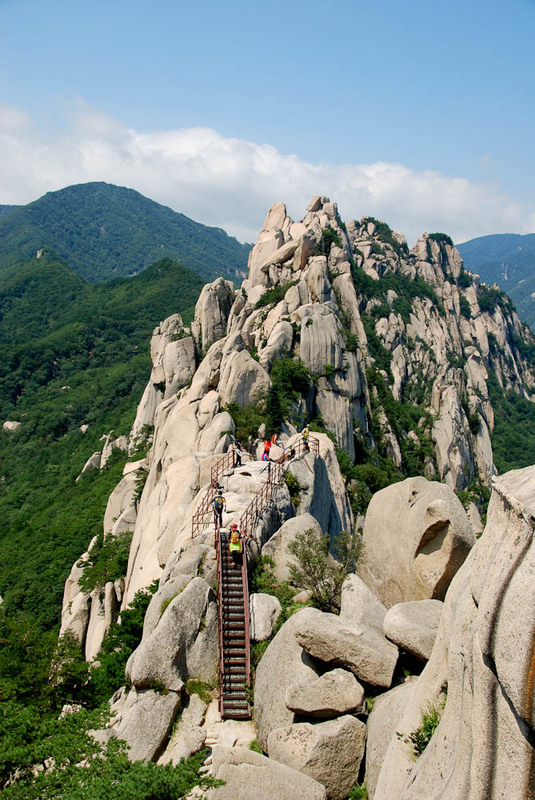 Magically, we woke up the next morning to a beautiful, cloudless day which was perfect for exploring Seoraksan National Park. Deserving of its own post, I’ll more about that later. 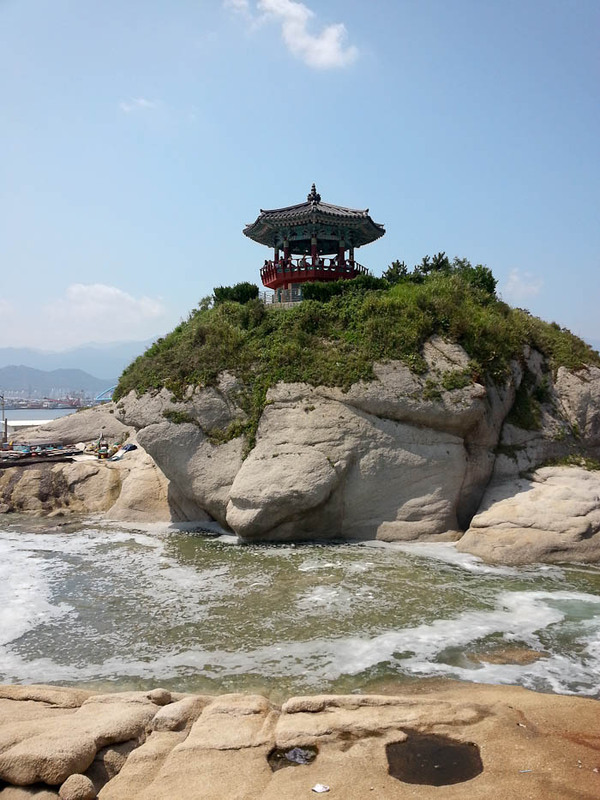 In a nutshell, it was stunning and only a 30 minute bus ride from of Sokcho. 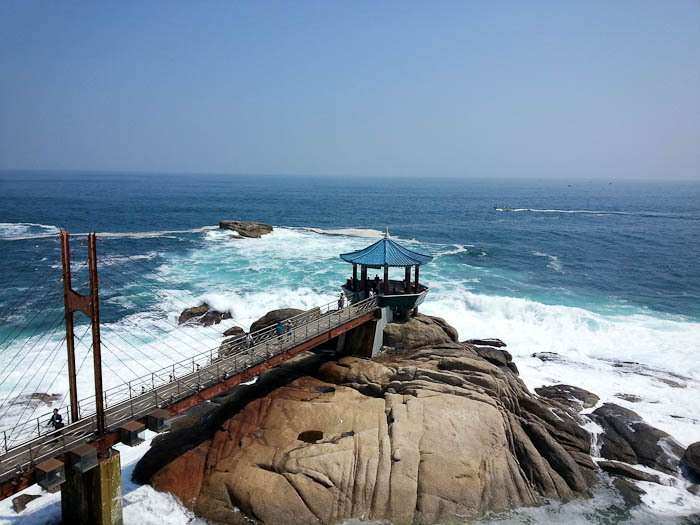 Thankfully, our third and final day in Sokcho was also gorgeous and since our bus heading to our next destination didn’t leave until the afternoon, we had time to check out Sunrise Pavilion which we weren’t able to see before due to the bad weather. 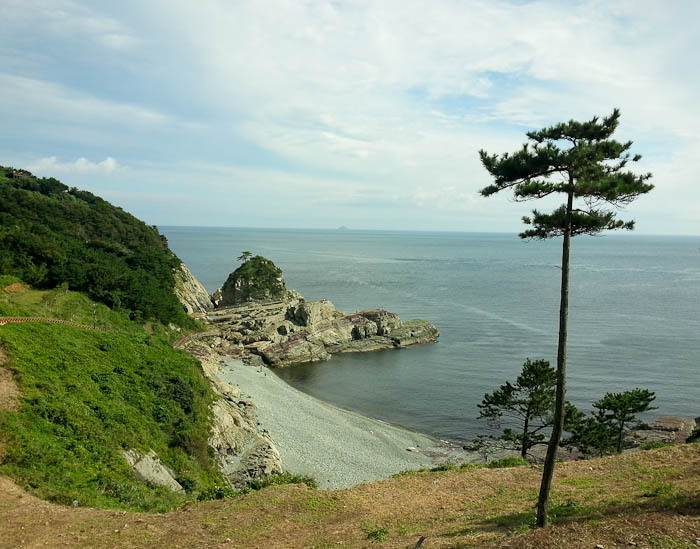 The water was the most amazing shade of aqua and the sunshine created a completely different view of the East Sea. 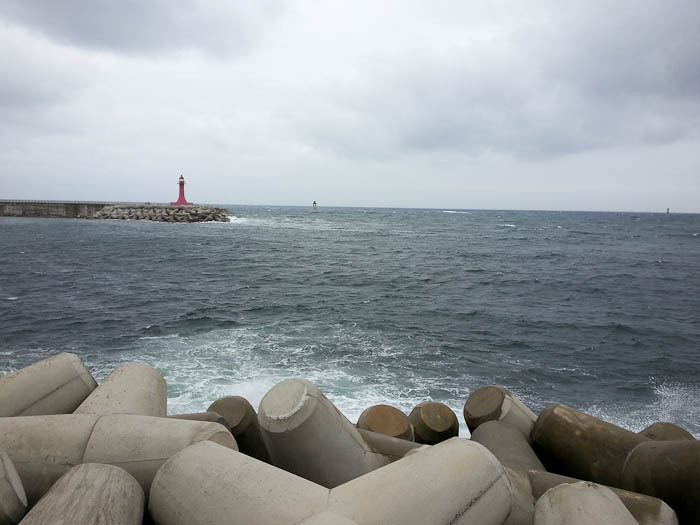 It was the perfect way to end our stay in the cute port city before moving on to Gangneung. 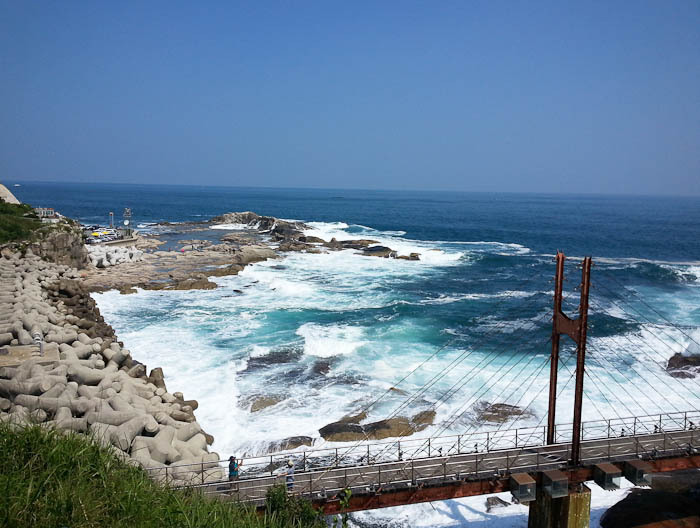 The brilliantly blue East Sea. Sunrise Pavilion, looking out to the East Sea. Unfortunately, we didn’t get our lazy butts out of bed in time to enjoy the sunrise. 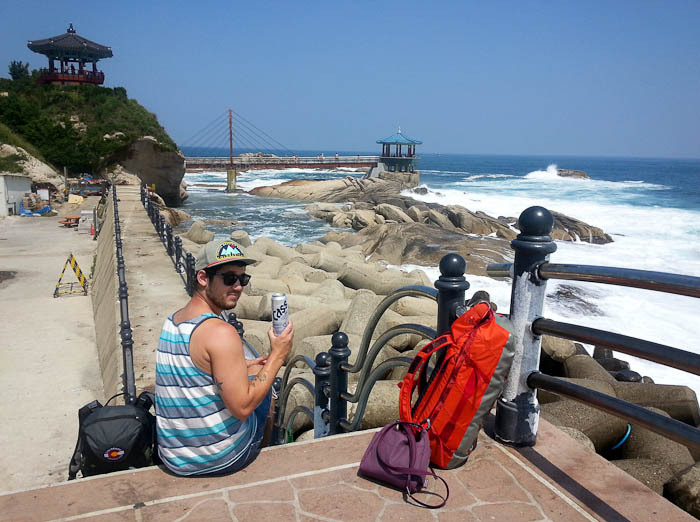 Enjoying a beer in the sunshine near Sunrise Pavilion before heading to Gangneung. 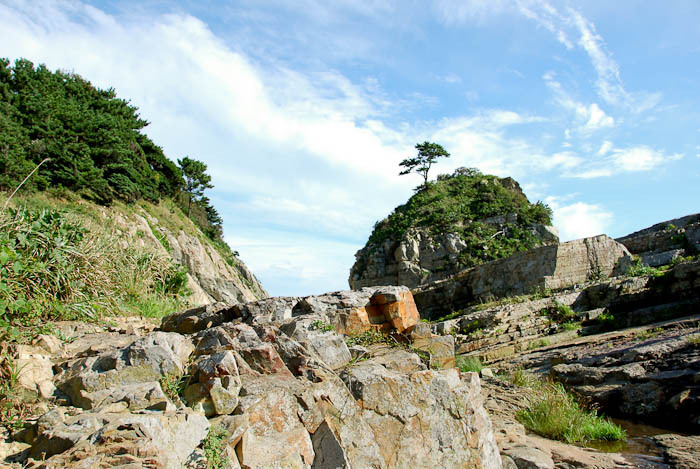 Sokcho on a sunny day. 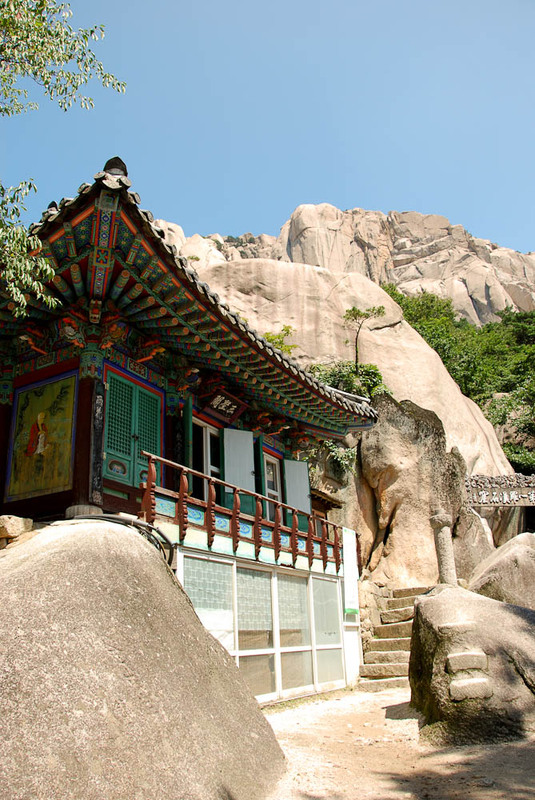 Chuseok (추석) is one of Korea’s most important holidays and this year it will be celebrated September 7 – 10. 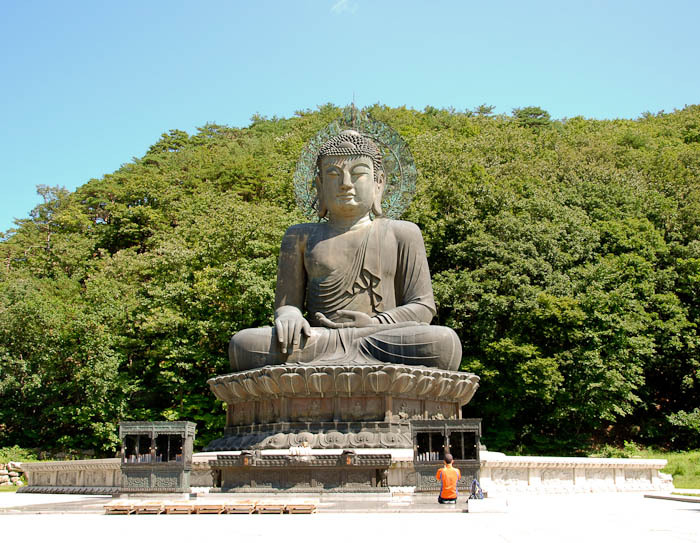 It’s also known as Hangawi, which means the great middle of August/Autumn. 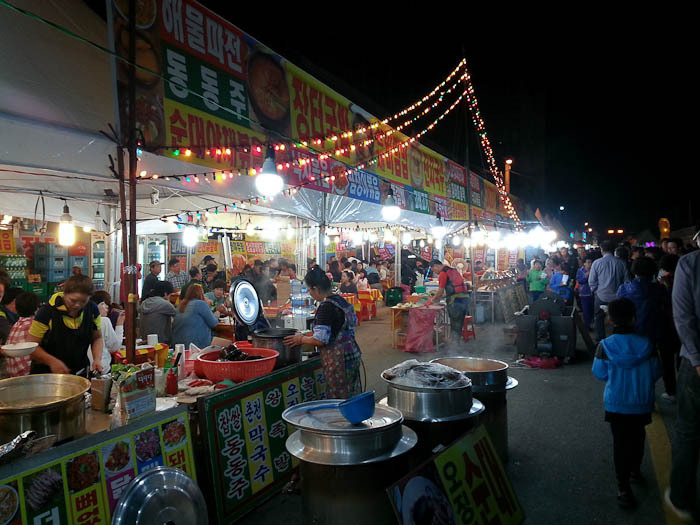 Similar to America’s Thanksgiving, most Koreans return to their hometowns to gather with family, overeat and give thanks for their ancestors and bountiful harvest. 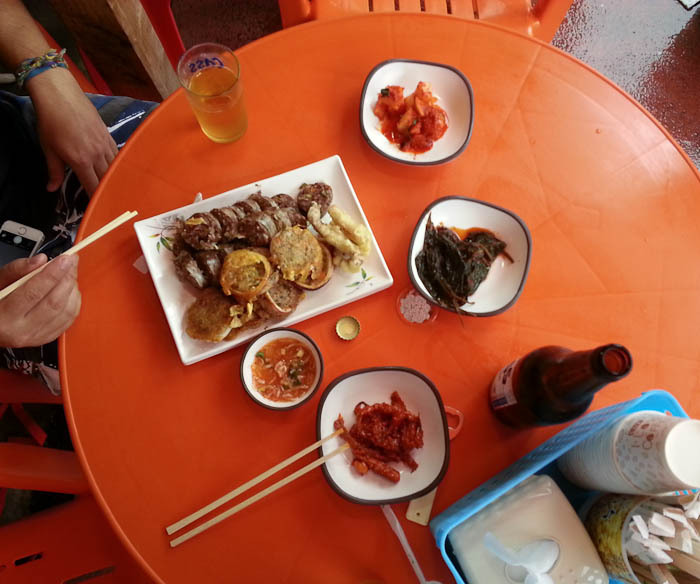 Gifts are exchanged and traditional food and drink such as songpyeon (small rice cakes stuffed with a puree of sesame seeds, chestnuts and red beans) and rice wine are consumed. 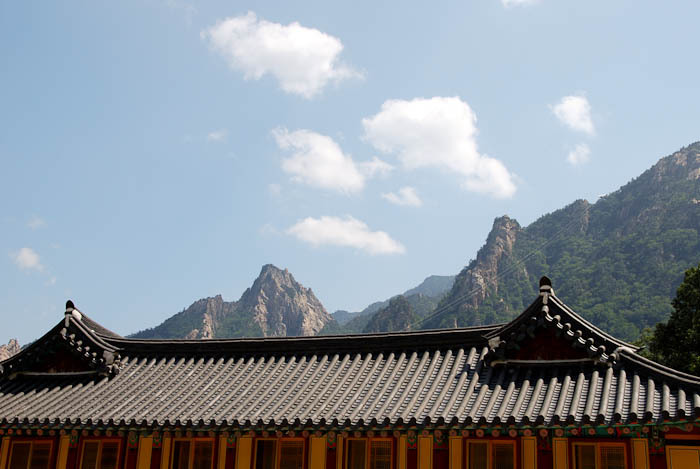 Dating back about 2,000 years, legend has it that Chuseok began as a result of a weaving competition between two princesses in the Silla Dynasty. 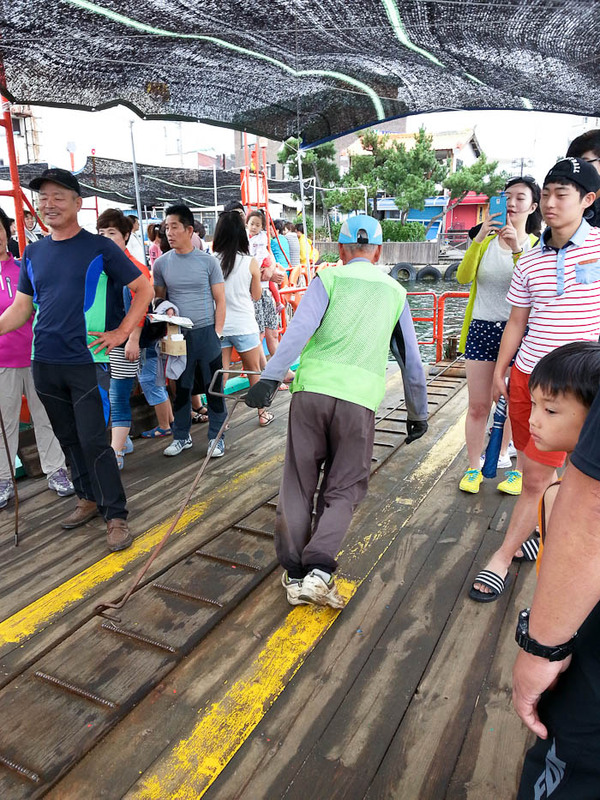 The fierce competition lasted for a month, ending on the 15th day of the 8th month on the lunar calendar during the full moon. The loser had to prepare a bountiful feast for the victors. 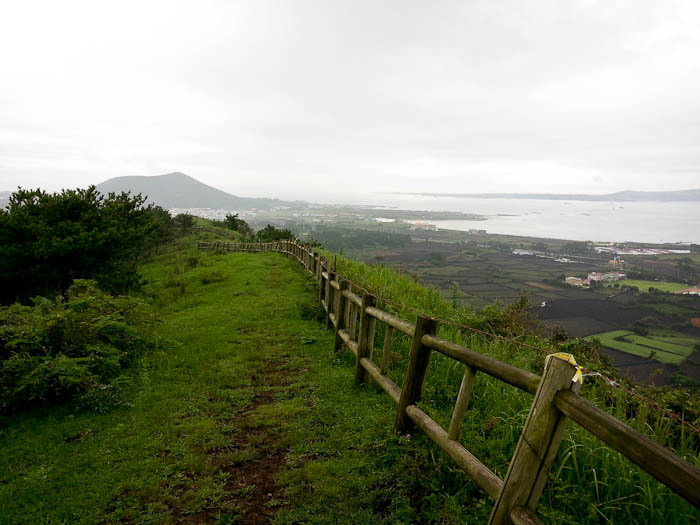 It is also believed that Chuseok comes from the shamanistic practice of worshiping and giving thanks to their ancestors and the harvest moon. Gift baskets take over grocery stores and markets this time of year. Who wouldn’t want a Spam gift set? 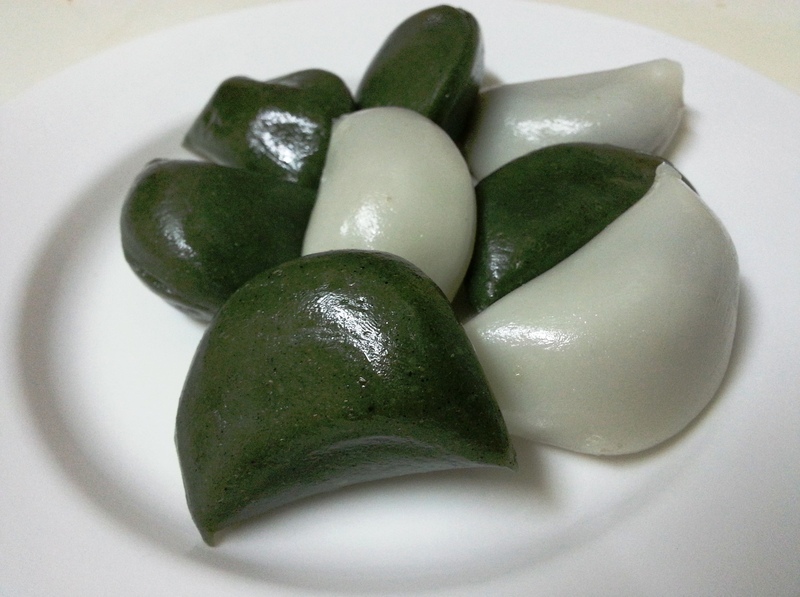 Traditionally, families gather on the eve of Chuseok to make songpyeon, small rice cakes filled with a puree of sesame seeds, chestnuts and sweet red beans. They are usually steamed with a layer of pine needles.